For more information visit us at www.usscgroup.com or call 866.312.6820 Part of the USSC GROUP Ride with the BEST! We Deliver Advanced Engineering In... Driver Comfort Ultimate Seat Technology G2A Series suspension seats ofer drivers maximum comfort with a durable pendulum scissors system. Passenger Safety FMNA fre suppression systems give passengers more time to safely exit the vehicle. • Cools, chokes and suppresses engine fres in seconds • Safe, non-toxic to occupants • Easy clean-up 59 FACT BOOK 2015 m ETRO m AGAZINE > rail manufacturers Sumitomo Corp. of America 600 Third Ave., 40th Floor New York, NY 10016-2001 (212) 207-0567 Fax: (212) 207-0813 Email: scoa.mail@scoa.com www.sumitomocorp.com Michihisa Shinigawa, pres./CEO Vanessa Goldschneider, pub. rel. and events mgr. Supplies complete state-of-the-art trans- portation systems and commuter railcars and ships, installs and builds their component parts. United Streetcar LLC 9700 SE Lawnfeld Rd. Clackamas, OR 97015 (503) 653-6300 Fax: (503) 653-5870 Email: kclarke@unitedstreetcar.com www.unitedstreetcar.com Kevin Clarke, pres. 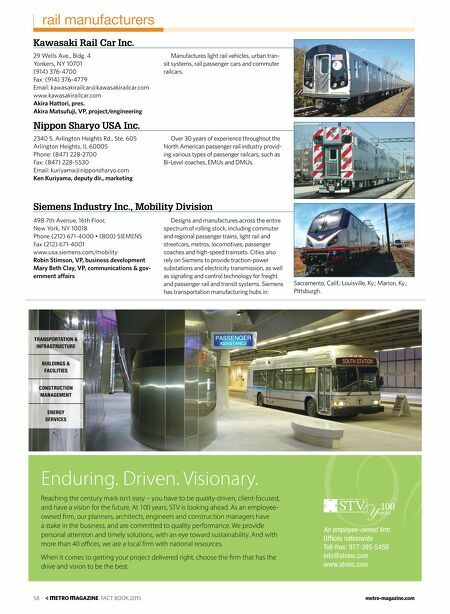 United Streetcar's mission is to provide mod- ern, efcient, safe and reliable U.S.-produced modern streetcars. Talgo Inc. 505 5th Ave. S, Ste. 170 Seattle, WA 98104 (206) 254-7051 Fax: (206) 748-6147 www.talgoamerica.com Antonio Perez, pres./CEO George Hlebechuk, CFO Joshua D. Coran, dir., ops/prod. dev. advisor Designs and manufactures articulated, light- weight, high-speed and intercity trainsets. With its design, Talgo equipment enhances passenger safety while minimizing acquisition and main- tenance costs. 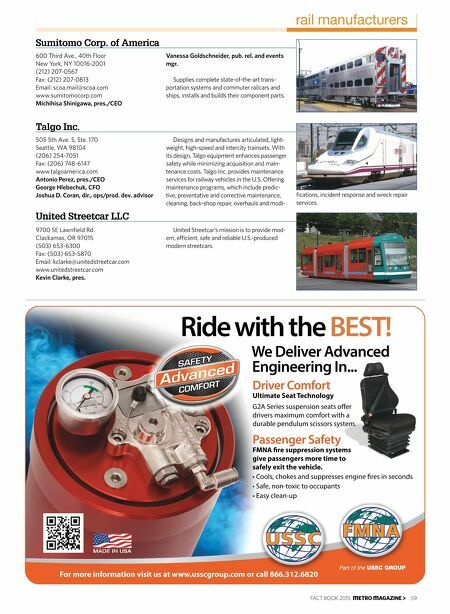 Talgo Inc. provides maintenance services for railway vehicles in the U.S. Ofering maintenance programs, which include predic- tive, preventative and corrective maintenance, cleaning, back-shop repair, overhauls and modi- fcations, incident response and wreck repair services.